Lovely (non-dater) Laura was making the most of being single, but also really (secretly) wanted to be married. A dear friend gave her a dating book that made her do a 180 and start being proactive with her dating life. Things were going well! Dating can be fun! Laura turned 30. Things were so sad. Dating is awful. Laura went to therapy. Learned to grieve. Found her smile again. Somewhere in the midst of that, she met a guy named Travis. But they never had a chance to get to know each other. To the back burner he went. Which brings us to January of 2011- 4 months after meeting Trav, if you’re keeping track. I wanted to be intentional with dating and moving toward some life goals again. It was around this time that I made a big decision in my career. I had been teaching 4th and 5th grade for 9 years at that point, and although I was extremely thankful for my job, it had not been my Plan A to work full time for that long. When I started teaching in 2002, my hope was to teach for a few years, get married at some point, and then have a baby and be a stay-at-home mom. As I learned to acknowledge and subsequently grieve that (totally normal) dream with my therapist, I realized that while I didn’t have complete control over my marital status, I did have the ability to choose and adjust my career. What a luxury! So, I started wondering what it would be like to do something besides teaching. I didn’t have a clear idea of what I’d do, but I took a leap of faith and decided to save up some money and then teach part-time for a year to give myself some space to dream and try new things. You can read more about that decision in this post called A New Dream. And then there was my dating life. I had given myself a little break for a couple months, but I really didn’t know what my next move should be. So, I prayed. If I’d learned anything up to that point so far, it was that I desperately needed God’s wisdom and help with this whole process. I remember praying and asking the Lord for ideas of how to move forward. I considered trying online dating again, but I wasn’t very excited about it. Mainly because I didn’t want to spend extra time on the computer. I had done online dating in the past (which took some courage because back in ye olden days of 2009, there was still a “last resort” feel to the whole thing- Dr. Cloud told me to get over it, so I did), and in a lot of ways it was very successful. I learned a TON about myself when I had to fill out forms and answer all manner of questions, and I interacted with a lot of different guys. But it only led to a few dates. So, online dating was an okay way for me to meet guys, but at the time I wasn’t in the mood to give it the effort it required. Ok, so how about any of the guys I already knew? Should I give any of them some extra attention? Hmm. What about…? No. Or maybe…? Definitely not happening. My guy friends were just my guy friends. And that was fine. Moving on. I thought we’d moved on. He’s so last year. Why does he keep coming to mind? So. Annoying. I tried to ignore the Travis thoughts and decided to put effort into asking friends to set me up on blind dates with single guys they knew. And yes, this is super fun, just like it sounds. It meant I had to be vulnerable and ask friends if they knew anyone I could meet. I didn’t need an elaborate match making scenario. I wasn’t asking people to find me a husband. All I needed were some introductions to guys I didn’t know. But even as I started asking friends for suggestions and going on some dates, guess who still came to mind? That Travis guy. Well. Something had to be done. I remember thinking that I could ask our mutual friends if Travis was dating anyone or have them try to set us up on a date, but the bummer about set-ups is that they can take a while. This person has to remember to call that person, and then they have to get back to you, and, and, and. I was feeling kinda impatient. So I asked the Lord to help me be real brave for a second, and I made My Big Move. If you are in a relationship or just not interested for whatever reason, no worries. God bless ya, and I promise not to be awkward if we run into each other at any future events. Well, I’m generally a bit dorky, but I won’t be awkward about this particular situation. *I’m not saying that lying is a good thing, but I am saying that sometimes it’s wise to round out the truth a bit so as not to sound like a crazy person. Because let’s be honest, that sentence could have said “I think about you all the time” but that just didn’t hit the light and breezy note I was aiming for. Although I’m a bit embarrassed to have shared that message with you word for word, there is a part of it that feels rather inspired. I asked him out without actually asking him out. I remember that I didn’t want to specifically say, “Will you go on a date with me?”, but I intentionally used dating lingo like “interested” and “in a relationship” so he’d know I wasn’t just looking for a new buddy. Even now, I’m still amazed that I sent Trav that message. God had been causing me to grow in so many ways that allowed me to feel free to take such a risk. First off, my thoughts on a woman’s role in the start of a relationship had really changed over the past few years. Like really changed. As in, the Laura of a few years prior would have NEVER sent a message like that because I thought it meant I was taking over the guy’s job and acting like the pursuer. In my new way of thinking, I saw that I had a big role to play in the dating game as an encourager. I definitely still wanted to date a man that was able and willing to lead his future family, but it was okay (necessary even!) for me to draw attention to myself or let someone know I existed. When Trav tells our story, he says the facebook message was like I’d stood up in a crowded room, waved at him, and said, “Hey Trav, I’m over here!”, and then I sat back down and waited for him to come find me. Bingo! That was exactly my goal. My Big Move also made me feel nervous about seeming desperate, but I had figured out a trick to dealing with that fear because it tended to creep up quite a bit in my proactive approach to dating. Any time a thought popped up along the lines of, “Oh, careful. People are going to think you’re desperate!” I would stop and ask myself, “Am I desperate? Would I marry just any guy that asked because I want to get married?” And the answer was always, “No way!” I knew marriage was too great a challenge and too big a decision to make an unwise choice. I was looking for a guy to marry that I could have a really awesome marriage with. A knocked-it-out-of-the-park, home run situation. And if I never met a guy who seemed up for that challenge, then I would choose to rock the single life for the rest of my days. So, once I reminded myself that I wasn’t desperate and that I couldn’t control what other people thought of me, I was able to move on with whatever proactive step I was attempting. Blah, blah, blah. You just want to know what happened after I sent the message, right? Well, though I wouldn’t know this until much later, Trav read the message and then immediately took a screen shot and showed it to a friend of his. The friend replied with, “I like her already” and Travis agreed. Phew! He didn’t think I was crazy! All that to say… my life’s pretty busy. This isn’t me turning you down — just saying I’m pretty thin for the next couple months. So he was interested, but he didn’t ask about a specific time to hang out. Apparently wanted to buy himself some time. Ok. I can roll with that. He asked me a few questions in the message, so I replied to those and we messaged back and forth a few times throughout the rest of the week. At one point we tried to one up each other based on who was the biggest dork. I know. Tough call. 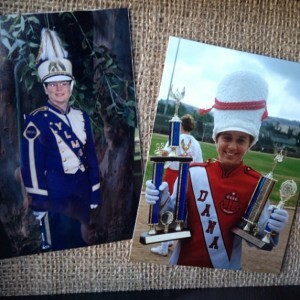 Trav thought he won when he shared that he had been the drum major of his jr. high band. Pretty high on the dork scale, right? Except that I was too. Tie game. Super cute, right? So totally MFEO (made for each other- movie quote, anyone?). Everything was going perfectly, and just a few days later, Trav asked me out and we started dating! No, wait. That’s the opposite of what happened. After those few messages back and forth, I stopped hearing from Trav. I knew he had said he was busy for a couple months, but it was strange to suddenly not hear from him. I suppose I could have messaged him again, but I felt like the ball was in his court. By early May (5 or 6 weeks since I’d heard from him), I opted to assume he wasn’t interested. Or at least not interested enough. I had taken to heart the theory behind the He’s Just Not that Into You book and movie- if a man is into you, he asks you out. If he’s not asking you out, he’s not into you. Maybe that sounds harsh or impatient, but I was a girl with a goal. Plus, I had finally started to believe that I was quite a catch and worth being pursued. So if a guy didn’t jump at a chance to spend time with me, I was moving on. Which is why Travis Austin ended up right where he was when this post started- on the back burner. Well, actually, to switch metaphors, I considered that door to be closed, locked, and double bolted. Done and done. Click here to go to the next post in this series. Eeeepp! You have a way with cliff-hangers! That was really brave of you to make the move and message him. Thank you for sharing what you wrote! Thanks, Chelsea! I’m so glad to hear from you! Keep going!!! You two are so cute! I love hearing the details, and I’m so glad you posted your exact message to Trav. I think it’s a masterpiece! I remember hearing some of this as it happened, but reading the details is so much fun! This is great!